I’m a mom of three, and our third baby (who isn’t really a baby at all anymore), is now 15 months old. I assure you it hasn’t taken me my entire 7.5 years of momming to come to the realization that I don’t breed go-with-the-flow offspring, but I have just come to accept that it’s okay that I don’t. When Braden was a baby, sleep was life. To this day he is still our child that relies most heavily on sleep, and his mood always reflects the amount and quality of sleep he’s had. He went through an awful sleep regression when he was 4 months old, so at the very welcomed advice of a good friend, I sleep trained him. It was a life-changing experience for our little family, and I have since sleep trained our other 2 babies with no regrets. However, one of the downsides of having sleep trained babies that rely on a routine and their need to get good sleep, is that they aren’t sleep-anywhere-and-everywhere kind of babies; at least ours aren’t. They’ve never been babies or toddlers who can “push it” by extending their wake time hours to accommodate family outings and fun events. All of our babies have been able to pull off a 30 minute nap in a stroller when they’re under 6 months old or so, Jonathan happily napped in the wrap I wore him in until he was about 5 months old, but other than that…it hasn’t been worth it to really push the babies and toddlers just to attend something where I can’t put them down for a nap in a playpen or crib somewhere. Don’t get me wrong, part of me is very jealous of your jet-setting, festival-going, beach-bum happy babies. My mind is always blown at how babies and toddlers and kids of all ages can just nap on-the-go predictably in a stroller, on a towel at the beach, in the boat on the lake, or in a baby carrier at any age. I even wrote about this a couple of years ago if it was even worth going on vacations with kids at all because of this. 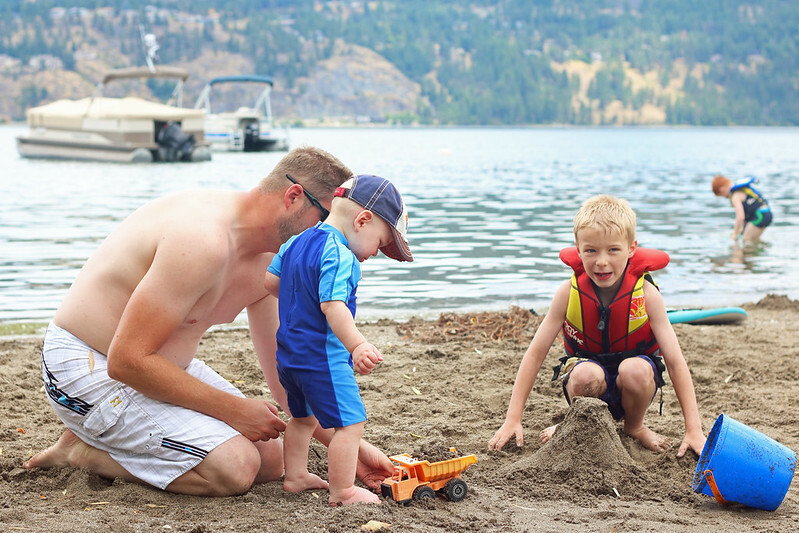 However, I have to admit, I recently enjoyed the most relaxing vacation of my life as a mom last month when we were in BC. It’s because I decided to not go anywhere or do anything other than stay at the house on the lake and enjoy it and embrace life with a 14 month old who needed his sleep. Even though it’s only a 1 hour fall-back time difference in BC, the babies we have brought there always have a difficult time adjusting to it and wake up in the 5 o’clock hour, and rely heavily on good naps to cope with the difference. I gave Jonathan a late nap and woke him up at supper time our first day in BC and put him to bed at 8:30 (which would be 9:30 at home) in hopes of him sleeping in and adjusting to vacation mode. It was a no go. A big flop. Fail! He woke up at 5:30 AM on the dot, which is 6:30 AM at home, which is his norm. 9 hours of overnight sleep, is far from his norm. When in BC we usually go on a couple of outings to Vernon. One trip is to an orchard for the day and the other to visit the water slides. This year I said to Jay “I don’t want to go anywhere or do anything this trip“, so I just sent Jay with our older boys to the water slides with their aunt, uncle and cousins and stayed at the lake by myself so Jonathan could have a much needed 3 hour nap. I enjoyed reading the first book I’ve had time to read in 2 years; it was heavenly and I have no regrets. I could have taken Jonathan to the water slides to enjoy time with family, but why? It’s a 40 minute drive to the water slides, I have no doubt he would have enjoyed going down the toddler slides with us, but for how long? There’s no kiddie pool for him to splash around in— only water slides. Jonathan can handle being pushed in his wake time hours much better than his brothers did, but he would have started to get cranky within an hour or two of being there, and then I have to ruin our older boys time by asking them to leave so Jonathan can get back and have a nap. He might have had a 1/2 hour car seat nap on the way back to the house, but then that would likely be the only nap he’d have that day, and thus goes the story of a sleep-deprived and cranky toddler on vacation. I decided not to push him and make him go on outings. We enjoyed our time at the house that we are so lucky to be able to spend time in that is right on the lake. 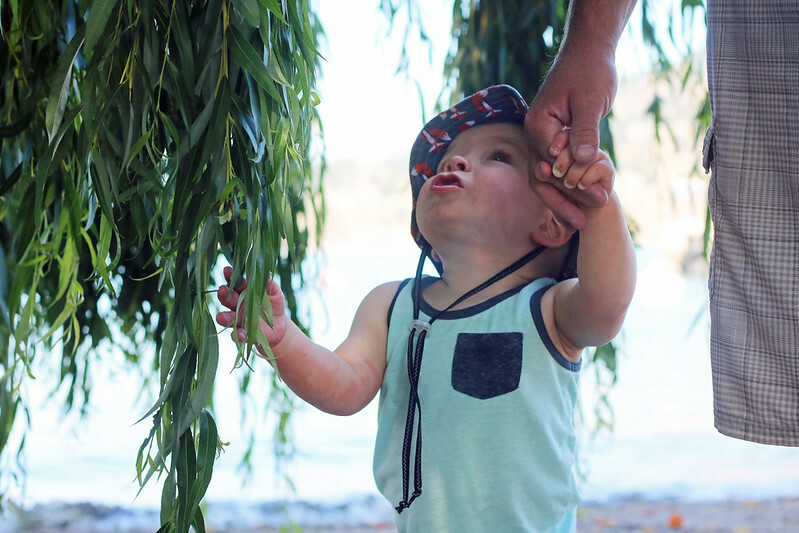 We went for lots of walks around the lake community and he had a blast just being down at the water. Not to mention we were in 30ºC+ weather the entire time we were there and I didn’t want his fair skin in direct sun more than he needed to be. I could put him down for a nap and go to the lake with my older boys and husband knowing that he was safely at home and happily getting rest. So for me, it’s definitely worth taking kids on vacation, but I have adjusted my expectations of what vacations look like. This was the best vacation I’ve ever had with my family because I didn’t have a cranky toddler to deal with. « Jonathan is 15 Months Old! Do you find your babies adjust? We also do the grandparents in BC every year, and my son is exactly like this!! 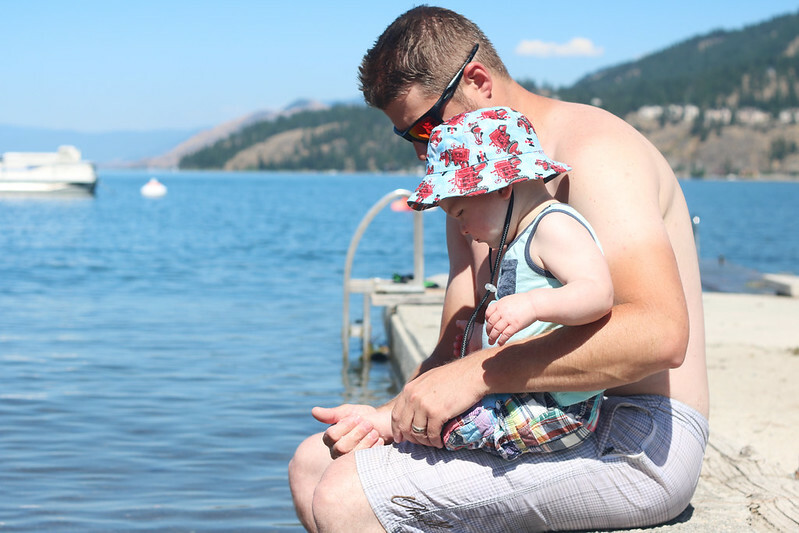 He’s 17 months this summer, wondering how you handle it through vacation? Just good naps and getting up early? Sigh… haha!